What an amazing first few days we’ve had here in Gurim!!! Despite the rainy weather, we’ve managed to continue moving and enjoying all the activities that camp has to offer. From pickle making to Gaga and everything in-between we are having an amazing time. Yesterday we were finally able to get into the Agam (lake) and take swim tests, and our mornings were able to continue as normal. Every morning after wake up we head to mifkad (the flag pole) where we gather as a whole camp to start the day. After this, Gurim goes to teffilot (davening). Our service includes a mixture of traditional prayers and other fun songs that allow all the chanichim to join in and create a fun and energetic atmosphere. After we head to breakfast and then nikayon (bunk cleaning). After nikayon everyone heads to chug (elective) where each camper chose the activity they would like to do. There are countless options and everyone chanich chose something that was right for them. After finally getting some nice weather yesterday we utilized it by spending as much time as possible outside. 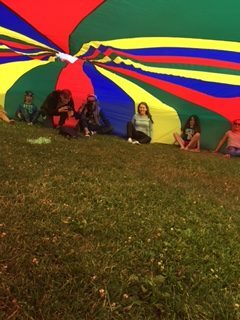 This included playing baseball, kickball and using a parachute were just a few among many outdoor activities. Each night we have a peulah erev (evening activity). Some of them have been done by bunk. Theses included bunk buddy bonding though making bracelets for each other. A different bunk peulah erev was erev return to earth. Each camper went to different station that each had a space themed activity. The evening was ended with a special Milky Way space treat. Last night we had Erev Superhero. Each bunk dressed up a counselor as a superhero of their creation. It ended with a lot of laughs and was overall a great evening. 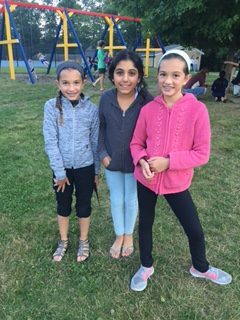 We’re looking forward to a restful first Shabbat and can’t wait for the rest of the summer.